Do you think of strength training and speed training as two completely separate forms of fitness? What if there were a way to combine the best of each training method in one efficient workout? Velocity training combines both strength and speed with an emphasis on increased power. The benefits of velocity training are nearly countless and can apply to almost any population. Velocity training improves performance for athletes, with both short term gains and long term muscular activation. With body weight or light resistance, this training can be completed in your home. It provides greater functional fitness than traditional forms of strength training. So just what is velocity training and how can it be done at home? Velocity training reduces the load you might use for simple strength training. You complete movements more quickly and with potentially greater range of motion. For example, typical strength training might perform squats with dumbbells or a heavy weight at ten reps over 60 seconds. Velocity training could reduce the load to body weight or a light weight held in front of the body. Using the same period of 60 seconds, you would complete as many reps as possible in the same 60 second time frame. You will generate a force similar to using a higher weight at lower speeds. By increasing the speed of the movement, you will experience the use of more muscles and neural connections (beneficial for everyone from conditioned athletes to senior citizens). You will also develop greater muscular control during eccentric phase (moving with gravity) of the movement. So understanding the concept of velocity training, what are its specific benefits? What are the Benefits of Velocity Training? Velocity training provides the potential to complete both cardiovascular and strength training simultaneously. Workouts become more efficient. You will experience both an increased calorie burn and greater muscular activation over strength training. When completed in an interval format, velocity training provides many of the same benefits as HIIT (High Intensity Interval Training). You can experience an increased calorie burn for the 48 hours following your workout. HIIT training also has tremendous anti-aging benefits. Senior citizens and new exercisers also experience enormous benefits from velocity training. Increased range of motion and use of the entire body results in functional training. This improves fitness for daily activities and sports performance. The use of lighter weights (typically around 30% of maximum weights), makes velocity training safe and adaptable to home settings. Additionally, because you are using your entire body to complete most of the movements, you can experience a calorie burn that is similar to running, without the impact. Time efficient workouts: Velocity training meets both your cardio and strength training requirements. You’ll burn calories at a level similar to running by using your entire body to complete movements quickly. You’ll also stimulate muscle development with traditional strength training movements. Your body will get smarter. Think about slowing a barbell as it descends during a bench press. Your body will have to control both phases of the movement during velocity training. This results in greater recruitment of both your muscular and nervous system. These gains are especially beneficial if you are a new exerciser, senior citizen, or seasoned athlete looking for new gains. You’ll do amazing things for your metabolism. 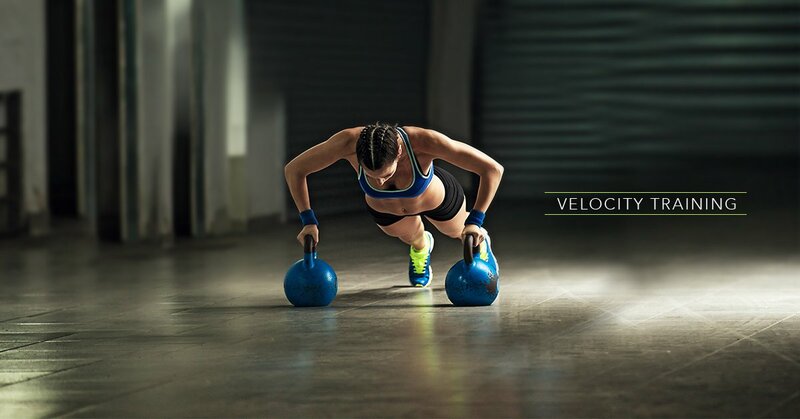 Use velocity training for high intensity, interval style workouts without requiring impact. This approach will increase your metabolism for up to 48 hours following your workout. This also stimulates production of Human Growth Hormone, supporting your muscle growth and overall health. You’ll build bone density without impact. Velocity training reduces the amount of weight required to complete strength training while maintaining or increasing the force generated. This directly stimulates the skeletal system supporting bone density. You will build visible muscle. Velocity training targets the generation of forceful movements from specific muscles. These powerful movements stimulate the same muscle fibers required for sprinting and maximum effort weightlifting. This results in visible muscle growth without heavy weights. Velocity training can be completed with nearly any home exercise equipment. Kettlebells, resistance bands, dumbbells, and a box are all very useful. Using about 30 to 35% of your maximum weight (or reducing movements to bodyweight), your goal is to complete your reps as quickly as possible, without sacrificing form or range of motion. Here is some of the best home fitness equipment for velocity training. Plyobox: Think you’re pretty good at push-ups? Use a plyobox to complete your push-ups at an elevation. They will be easier so you can do more and do them more quickly. This will train your body to crank out more powerful reps on the floor. Elevated push-ups are also a great option if you struggle to complete full push-ups on the floor. Plyoboxes are also great for squat variations. Check out Bulgarian split squats or Box Squats for velocity training friendly variations of a squat. Resistance bands: This may be the most versatile piece of velocity training equipment there is. Loop this onto your pull-up bar for a velocity training variation of pull-ups. Resistance bands also work well for Pallov presses, squats, bicep curls . . . you name it. Because they provide resistance during both the eccentric and concentric phases of the movements, resistance bands are a natural fit with the improved control of movement that is a benefit of velocity training. Kettlebells: Use Kettlebells to complete simple swings or break Olympic lifts into Kettlebell Cleans and Snatches. Kettlebells encourage full body involvement in dynamic movements, increasing the benefits of velocity training. They are also useful for front squats and goblet squats, encouraging upright posture and proper depth. Dumbbells: Dumbbells let you isolate each side of the body individually. They also allow a greater range of motion than barbell work. This enhances the muscular recruitment benefit of velocity training. Use dumbbells for bench presses, shoulder isolation work, or bicep/tricep isolation. Remember to keep your movement controlled. While you want to complete your reps quickly, the weight should be heavy enough to challenge the targeted muscle. Avoid overextending your joints or losing core engagement. Check out the latest in functional fitness accessories! As you can see, nearly any workout you complete in your home gym, can be reworked as a velocity training workout. Use an interval approach that aims for maximum reps in a period of 30 to 120 seconds. Alternate your work intervals with equal period of recovery. You’ll create a time efficient workout that targets both strength and cardio increasing muscle mass and metabolism in as little as 30 minutes. With so many options, which approach to velocity training will be your favorite?